Return/Jump was a video retrospective curated by Tom Bowes. The program consisted of evening and matinee screenings. 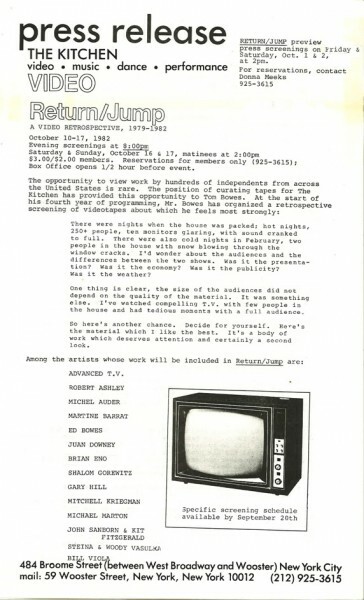 Artists included Advanced T.V., Robert Ashley, Michel Auder, Martine Barrat, Ed Bowes, Juan Downey, Brian Eno, Shalom Gorewitz, Gary Hill, Mitchell Kriegman, Michael Marton, John Sanborn & Kit Fitzgerald, Steina & Woody Vasulka, and Bill Viola.